The project includes a well-designed dissemination campaign. In the framework of this campaign, dissemination materials have been created, distributed and errected at implementation areas. Metallic board in English/Greek, errected at the implementation area of the project in the Municipality of Nikiforos Fokas, Crete, South Greece. LIFE FOCUS - The last issue of LIFE Focus publication is dedicated to olive and oil and to related environmental issues. 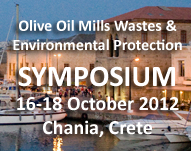 LIFE projects dealing with olive oil production and olive waste management are presented. Download a copy of the publication (Copyright European Union 2010).